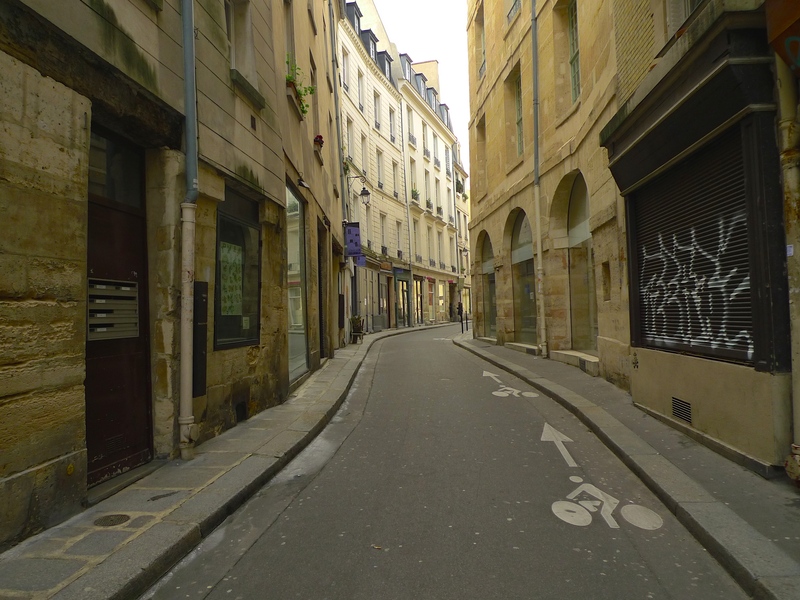 RUE CHARLEMAGNE IS a street in the Marais quarter of the 4th arrondissement of Paris. 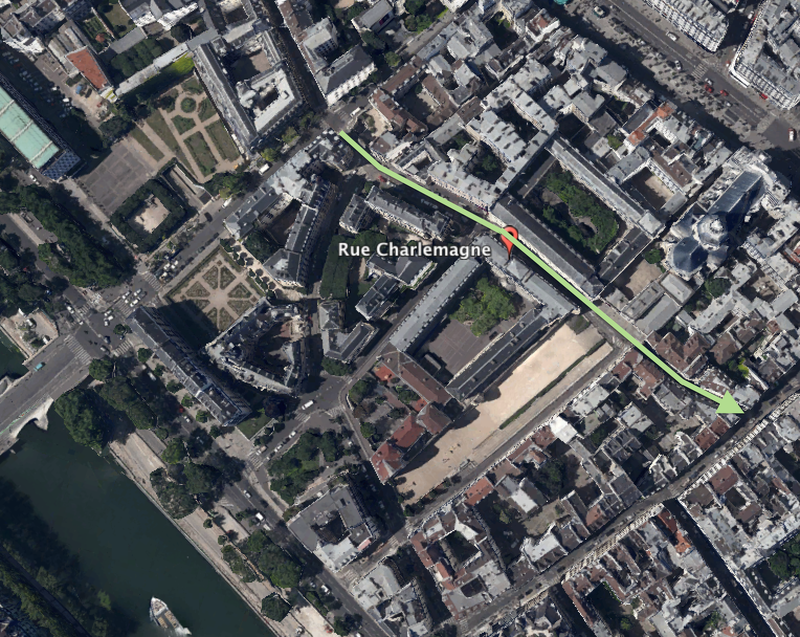 It stretches for 236 metres from rue Saint-Paul to the junction of rue de Fourcy and rue des Nonnains-d’Hyères. There’s been a street of some sort hereabouts since the middle of the 14th Century and during its lifetime it has had a variety of names. 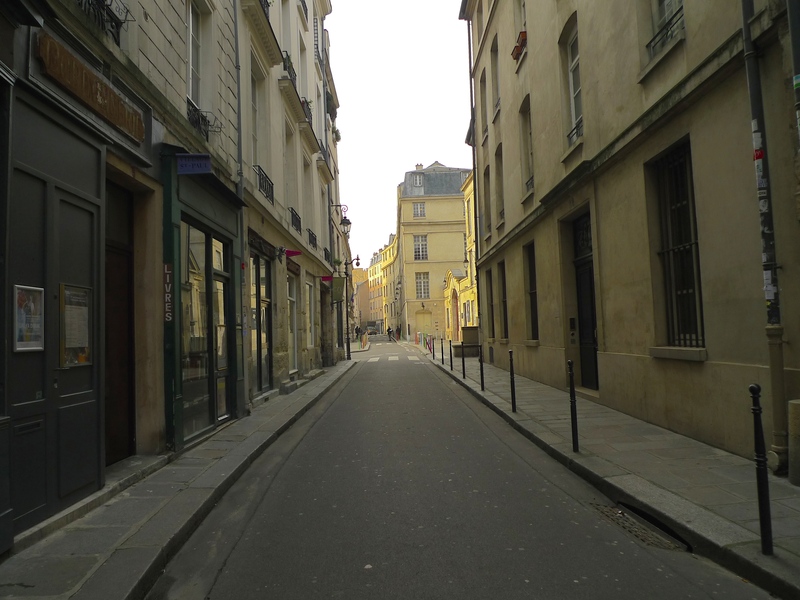 Originally known as rue de Jouy, the street became rue de l’Abbé-de-Jouy, rue de la Fausse-Poterne, rue de la Fausse-Poterne-Saint-Paul, rue de l’Archet-Saint-Paul and rue des Prêtres-Saint-Paul. 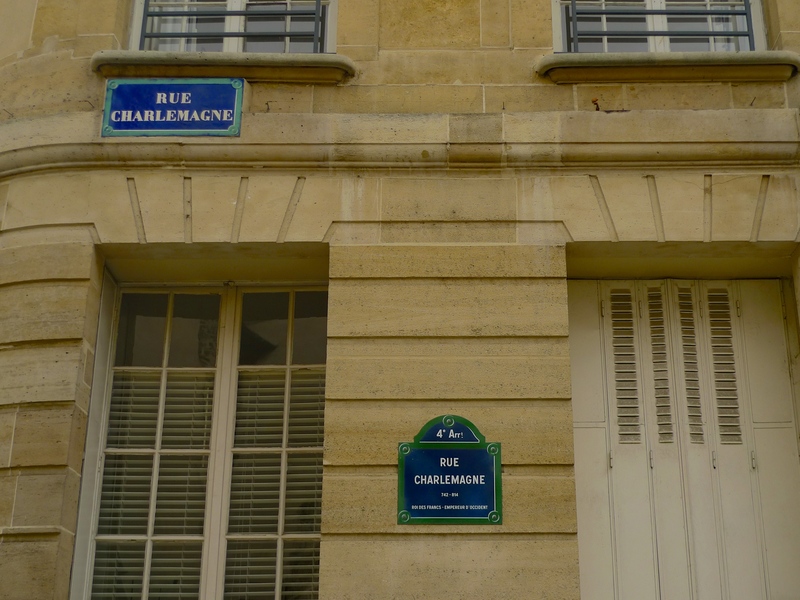 The name, rue Charlemagne, dates from 1844 and it comes from the name of the school in the street, the Lycée Charlemagne, which in turn is named after Charlemagne, or Charles I, King of the Franks, who united most of Western Europe during the Middle Ages and laid the foundations for modern France and Germany. 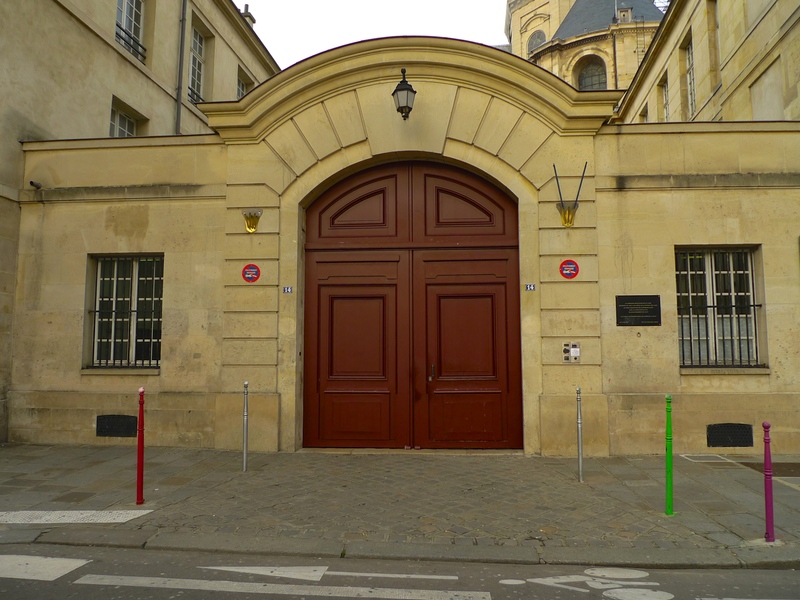 The Lycée Charlemagne is a significant feature of the street. 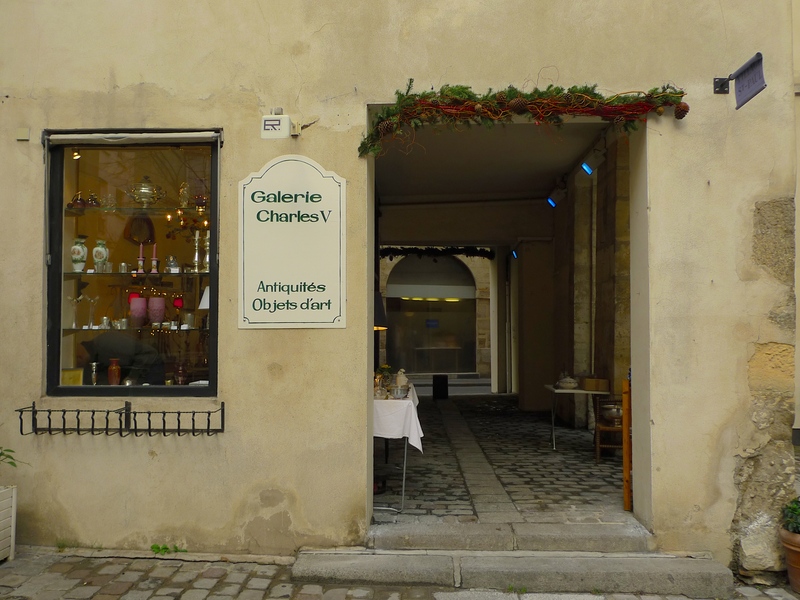 It was founded by Napoléon Bonaparte in 1804 although it occupies buildings that are very much older and were once home to the Order of Jesuits. 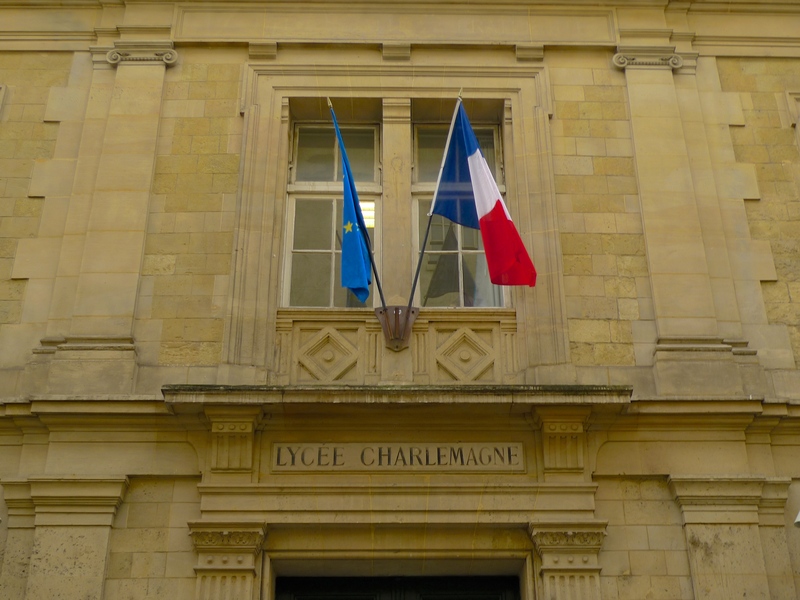 Today, the Lycée offers two-year courses in mathematics, physics, chemistry and engineering science preparing students for entry to the Grandes écoles. 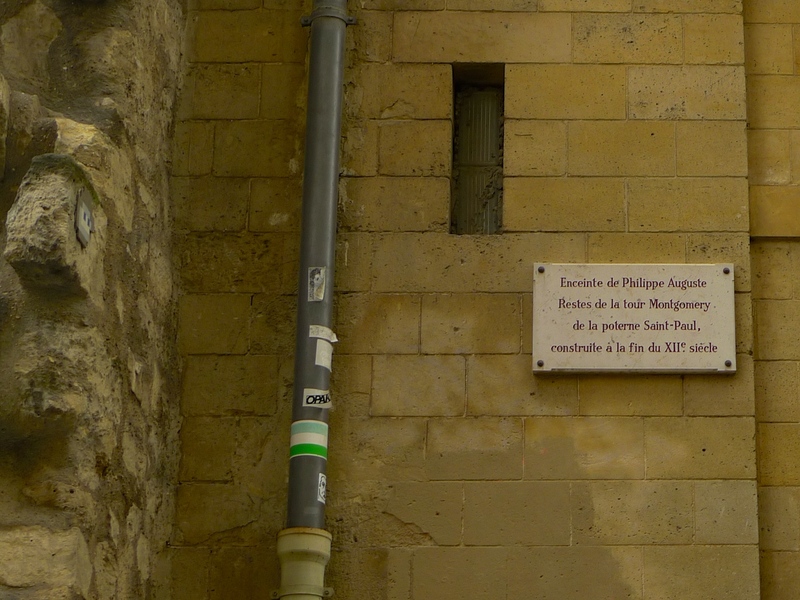 Another significant feature of rue Charlemagne are the longest surviving remains of the Philippe Auguste Wall. 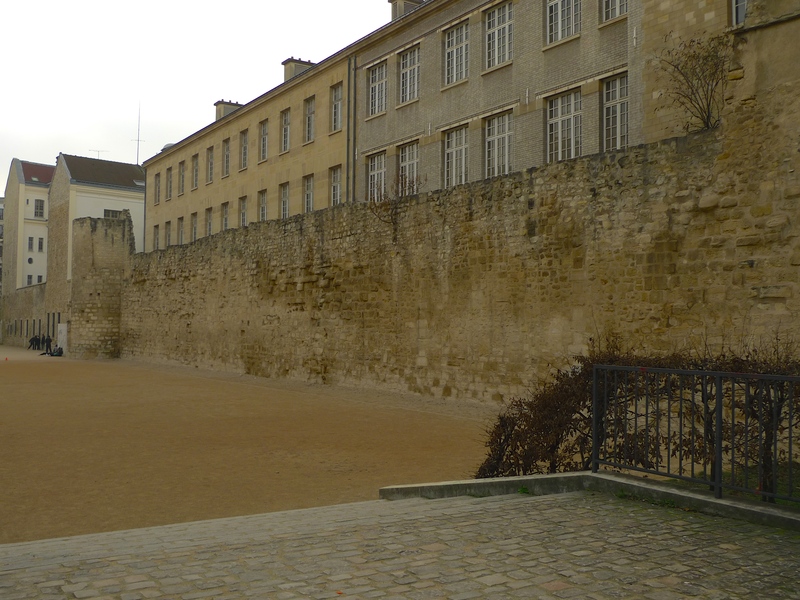 Before leaving for the Third Crusade, Philip II of France (Philippe Auguste) ordered a stone wall to be built to protect Paris in his absence. The wall was built between 1190 and 1215 and it was 5,100 metres long, between six and eight metres high and enclosed an area of 253 hectares. 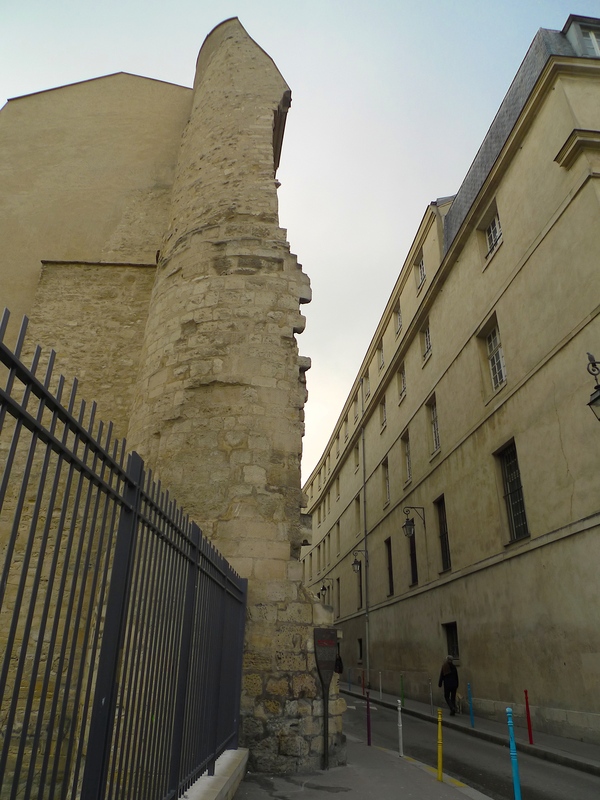 These remains of the Philippe Auguste wall stretch from rue Charlemagne along the Jardins Saint-Paul but on the corner with rue Charlemagne are the remains of the Tour Montgomery named after Gabriel, comte de Montgomery, a French nobleman and a captain in King Henry II’s Scots Guards. Montgomery is remembered for mortally wounding King Henry in a jousting accident. For a short time after the accident, Montgomery was imprisoned in what became the Tour Montgomery. From his deathbed Henry absolved Montgomery of any blame, but, finding himself disgraced, Montgomery retreated to his estates in Normandy. There he studied theology and converted to Protestantism, making him an enemy of the state. 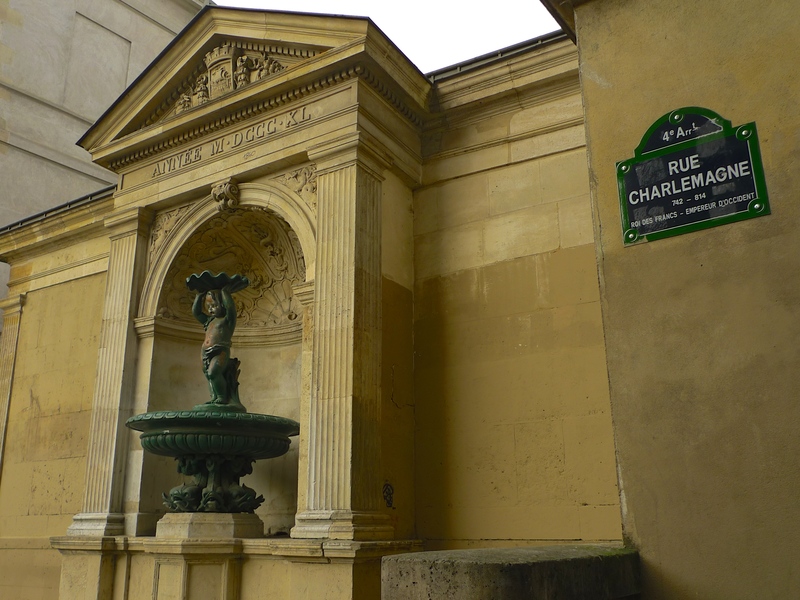 Next to the Lycée Charlemagne is the Fontaine Charlemagne, a decorative fountain built against the presbytery wall of the church of Saint-Paul-Saint-Louis. On the pediment above the fountain are the Coat of Arms of the City of Paris and the Roman numerals indicating the year 1840, the year the fountain was created. 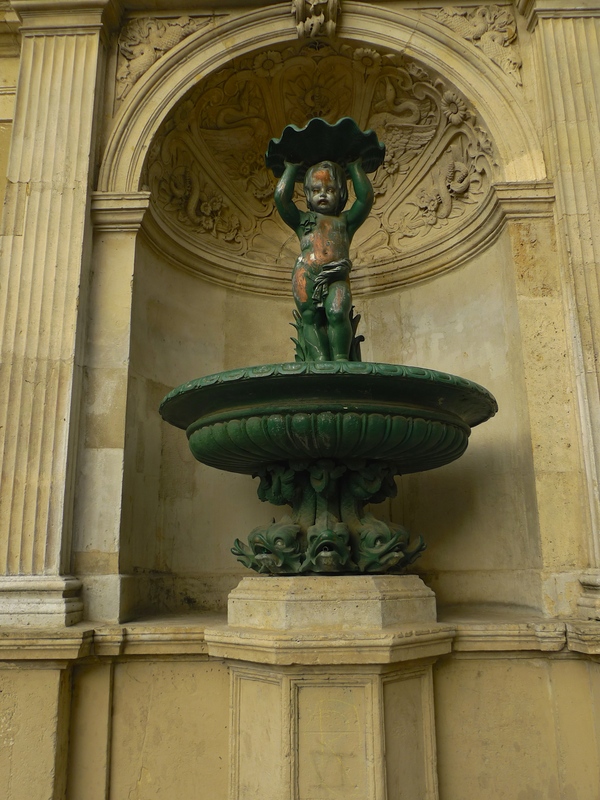 The fountain itself comprises a niche decorated with aquatic plants and animals and a cast iron basin supported by dolphins with a statue of a child holding a seashell over his head. 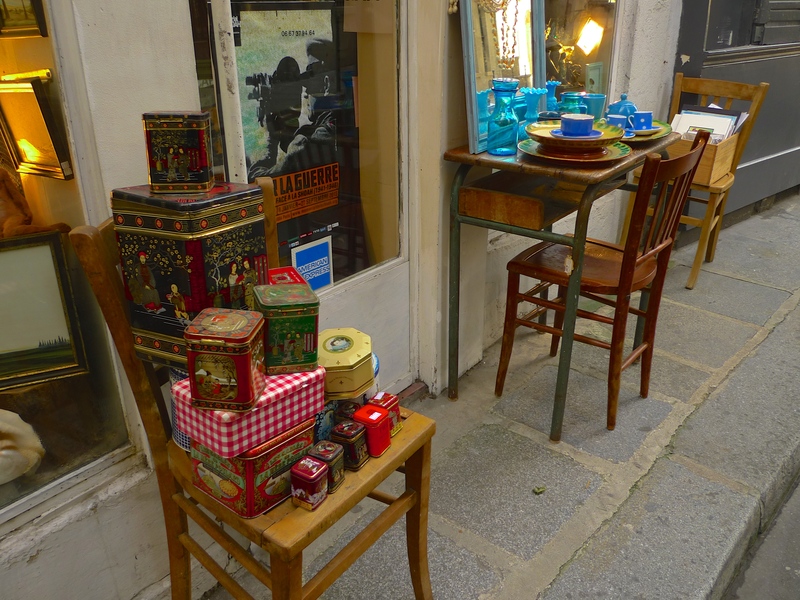 At the eastern end of rue Charlemagne is a courtyard with a cluster of art and antique shops. 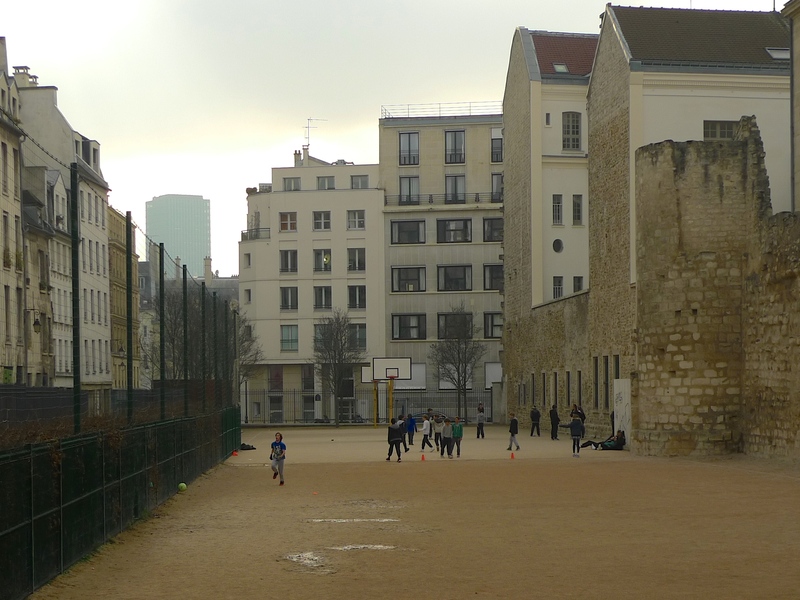 As I walked along rue Charlemagne recording the sounds around me, I came upon some children playing football in the Jardins Saint-Paul in the shadow of the Philippe-Auguste wall. 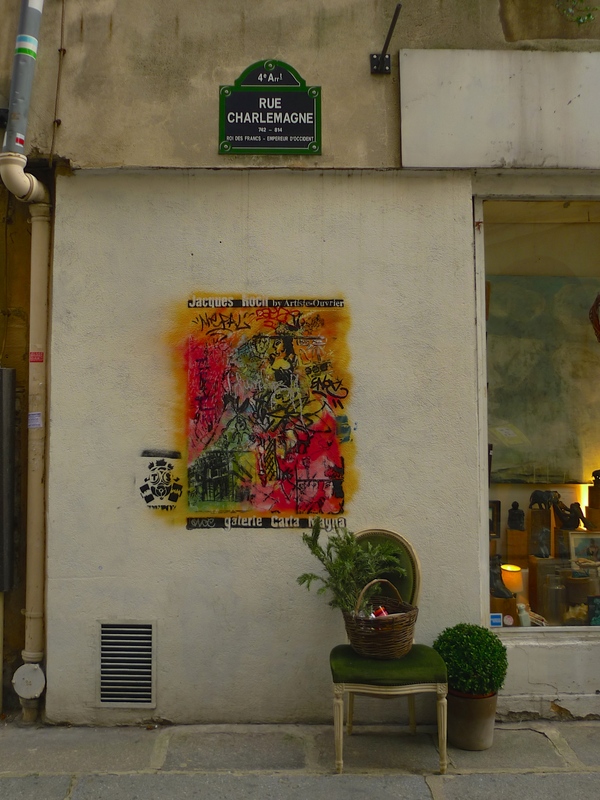 As I approached, some of these children spilled over into rue Charlemagne itself just below the Tour Montgomery and from there they seemed to form an unexpected centrepiece to my soundwalk.